For the DUP there’s only one figure that jumps out of the elections, local and European, and it’s not the 131,000 odd that their uninspiring European candidate polled. No, the figure that liquefies their bowels is 75,806, the vote that their nemesis Jim Allister polled. The DUP tried to cover it up by staging in breach of etiquette an unmannerly premature performance of roaring and cheering at the count on Monday evening pretending their candidate had been elected a day before her declaration. The smiles were false, the cheering hollow. 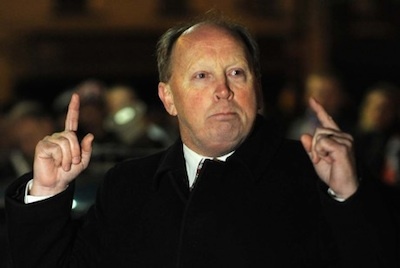 Oh yes, the official DUP line is that Allister’s share of the vote was down from 13 per cent in 2009 to 12 this time. Thirteen schmirteen. The ordinary punter sees only 75,000 votes. Allister is here to stay. His TUV party got 13 councillors. He took greatest pleasure in winning seats in the DUP heartland of Bannside, which as he woundingly reminded a loud-mouthed Ian Og is the name his father took for his peerage. Allister is now a player. He can’t be ignored in any attempt to create a unionist pact for the 2015 general election. Why, he might even decide to stand in east Belfast himself. Heh heh. What price Gavin Robinson at the bookies then? The TUV will win seats in the 2016 assembly. In all likelihood he will deprive the DUP of the position of First Minister which, thanks to DUP hubris in 2006 St Andrews Agreement, goes to the leader of the largest party. Three TUV seats should ensure that’s Sinn Fein. Allister is simply the most able and articulate result of the stupidity and cowardice of the DUP leadership since the 2011 Assembly elections. Confronted with rivals on their right they committed the cardinal political error of trying to outdo them on the right. They took to the streets to participate in UVF/PUP orchestrated fleggery. Senior figures of the party shared platforms with known UVF men. DUP councillors and assembly members indulged in incoherent, ungrammatical imitations of Jim Allister’s rhetoric. What was their reward? The TUV took a seat in the Shankill and the PUP took the seat of the DUP leader in Belfast City Council. Allister got 75,000 votes. Smart eh? Do you think the DUP leaders will have learnt a lesson? Not a bit of it. They’ll engage in a Gadarene stampede further right frantically trying to outdo Allister so that the unionist electorate will conclude that Allister is correct as both Robinson and the hapless Nesbitt are sucked into his orbit howling at the moon. On the other side of the fence, the stupendous success of Sinn Fein in the south and their effortless superiority in The North – sweeping in on the first count in the Euro election – only serves to reinforce Unionist paranoia. You could see that immediately in the defensive political foetal position automatically adopted by the less than quick-witted Edwin Poots when asked about Sinn Fein’s Southern triumph. We don’t care, we’re in the UK. Makes no difference. Michelle Gildernew pointed out it might if he’s dealing with a Sinn Fein minister of health in the North-South Ministerial Council. You can see where this is all leading. Apartheid in unionist-controlled councils such as Lisburn and Castlereagh and Mid and East Antrim, continuing deadlock at Stormont, but more immediately no prospect of any agreement on parades and the past as each Unionist fragment tries to out-Allister the others. Don’t look to Dublin or London for both governments have reason to be concerned about their own survival until the designated date for their general elections in 2015 and 2016. One thing you can be sure of is that in the British general election, if there is such a species as liberal Unionist, the DUP, UUP and TUV will ensure that no evidence of such a species can emerge in the voting. Unionist parties are all now right wing and far right wing. Meanwhile, who will be the new Dublin minister of foreign affairs now that the unlamented Gilmore has gone? At least Gilmore was consistent on the north for 40 years. You could say he had the wrong end of the Stick!